Open Late: Every night till midnight. The "other" Nuevo Leon, featuring handmade flour tortillas. At first glance Nuevo Leon looks like just another corner joint, with many of the usual Chi-Mex standards. 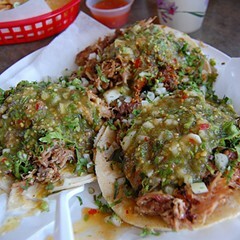 A few distinctive foods typical of the restaurant's Mexican namesake, however, set it apart. Machacado con huevo is a scrambled egg taco showcasing cesina, shredded beef thats been dried, then rehydrated and pounded. With this we enjoyed a michelada, kind of a beer-based Bloody Mary made with Angostura bitters and Tabasco sauce, fresh-squeezed lemon, salt and pepper, and beer over ice (theres some evidence to suggest that this drink is the long-sought cure for the common cold). The state of Nuevo Leon is landlocked--perhaps thats why the fish we had here was so poorly prepared, dry and unduly fishy. Both it and the soggy fries it came with, though, become much more delicious when splashed with the house-made pico de gallo. The chicken mole was good if unmemorable, the meat relatively meaty and the sauce quite chocolaty. Flour tortillas are most common in the north--and this is one of the few restaurants in Chicago that make their own tortillas de harina; you can really taste the difference. This is a very friendly place; when you come in on weekends, youre offered a south-of-the-border amuse-bouche: a taquito with a dollop of barbacoa, pounded with peppers and onion, a juicy mouthful to get the meal going. Afterward you're brought a complimentary plate of melon, apple, and orange. Nice.